Masterful filmmaking. It does limit the shameful American slavery experience to 12 years and have unwanted famous faces popping up to say hello. 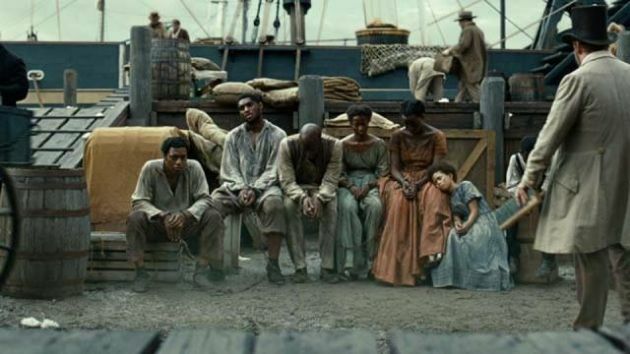 But McQueen's focus is all on Solomon Northup (Chiwetel Ejiofor) and his unjust slavery. Even Michael Fassbender's powerhouse plantation owner Epps doesn't eclipse Solomon and other slaves' harrowing experiences. The punchline is that without a big payback or satisfying epilogue, we are left to grapple with the fate of the fellow slaves Solomon leaves behind at the end. It gave me a pleasure seeing this in a packed theater the day after Thanksgiving in one of the beautiful screening rooms of the Brooklyn's cultural mecca, BAM (Brooklyn Academy of Music) with very mixed audiences. I couldn't help but comparing this film to the best film I've seen this year, The Act of Killing- for both dealing with a collective amnesia of sort, especially when witnessing older white audiences wincing in their seats during many of the film's difficult moments. My minor issue with the film is what Solomon went through in the film didn't feel like 12 years. If McQueen's intention was that of a surprise that, indeed it's been 12 years and his kids are all grown up, that he's been unjustly kept as a slave, it didn't work for me. It would have a better impact if there was some kind of indication of passage of time. I totally understand how that come across as anything but cheesy, but McQueen would have found the way to show it, just like the rest of the film not being anything but cliché. Definitely among one of the best this year.